There are some books – many of them children’s – which are as quintessentially ‘English’ as a cup of tea and messing about on the river (both of which feature heavily in this film). Kenneth Grahame’s classic story The Wind in the Willows is one such case. The story of four animals – Mole, Ratty, Badger and the accident prone Mr Toad – who live in decayed glory in an idyllic rural England which seldom exists outside of the imagination of the most vivid of writers, has enchanted children and adults alike since it was first published in 1908. 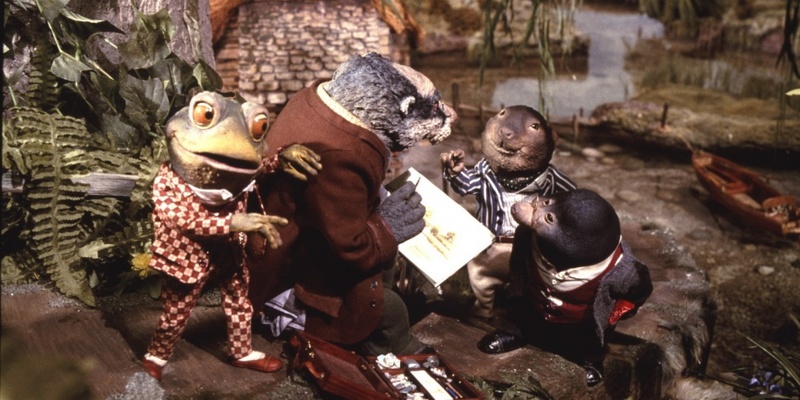 Their adventures – mainly involving Toad being rescued by the other three from one mishap after another, as well as the friends avoiding the machinations of a band of weasels who inhabit the dark and dangerous Wild Wood – make for enchanting escapism in an engrossing and totally believable world where animals rule, and any human characters are mere subsidiaries, simply there to fill in the background. In the years since Grahame wrote his book, there have been countless adaptations with everything from stage plays to live action screen versions. However, with the story centring on walking, talking animals, using puppets as this BAFTA award winning version does, captures a sense of realism and believability that humans never could. Here the viewer seldom considers Mole and his comrades as anything other than proper flesh and blood characters, as opposed to real people dressed (usually pretty unconvincingly) as animals. Produced for Thames Television by the legendary British animation studio Cosgrove Hall Films (creators of such iconic kid’s TV as Danger Mouse and Postman Pat), their retelling of Grahame’s fantasy, which spawned several spinoffs, is as enchanting now as when it first aired between 1984 and 1988. Its secret is that, by the sheer nature of its story, it inhabits a world which, save for the odd vintage car and steam train, is unaffected by the passing of time or the outside world. This is a pastoral vision of an England where good always triumphs and bad gets its comeuppance, and where everything moves at a more leisurely pace – including the story itself which never seems in a rush to finish. The production’s air of ‘Britishness’ is continued with a cast of stalwart thespians who provide the voices for the characters, including Sir Michael Hordern, David Jason and Beryl Reid. In our world where everyone, including children, are constantly rushing from one thing to the next, we could all learn a lesson from the land inhabited by Mole and his chums where things just amble along, and are none the worse for that.